Many of the popular flavours of the famous Ubuntu Linux system such as Kubuntu, Ubuntu Kylin, Ubuntu Budgie, Ubuntu MATE and Xubuntu, have released beta downloads for the upcoming Long-Term Support release of Ubuntu 18.04. Typically, the Ubuntu team releases an LTS edition of the OS, every two years, which will carry major security updates and patches, as well as full support, for five years. Most users typically prefer to stay on the LTS releases, and upgrade when necessary; but some prefer to opt for newer packages and will instead upgrade to the shorter 9 month support standard releases. Pre-releases of the Bionic Beaver are *not* encouraged for anyone needing a stable system or anyone who is not comfortable running into occasional, even frequent breakage. They are, however, recommended for Ubuntu flavour developers and those who want to help in testing, reporting, and fixing bugs as we work towards getting this release ready. Beta 1 includes some software updates that are ready for broader testing. However, it is quite an early set of images, so you should expect some bugs. However, this is great news, as with an expected final release of April 26, 2018 on the horizon, it means that with the beta being released, hopefully the majority of major bugs can be ironed out in a quick and painless fashion. Features Plasma 5.12, KDE Applications 17.12.2, VLC replacing Dragonplayer as the default player, Muon Package Manager and other updated applications. Plays mp3 out of the box, improved keyboard shortcuts, better font handling for Chinese and Korean users, new applets, support for dynamic workspaces, minimal installation option, and support for openvnc connections via the network-manager applet, and more. MATE desktop 1.20 with HiDPI display support with dynamic detection and scaling, global menu integration improvement, Mutiny layout with MATE window applets, and minimal installation option. With the next major release of Ubuntu around the corner, it will be interesting to see if Canonical has any surprises up their sleeve, or any other major changes to announce. We already know that Ubuntu GNOME has been shift into mainline Ubuntu, as discussed here so it will be good to see how this beta test progresses. 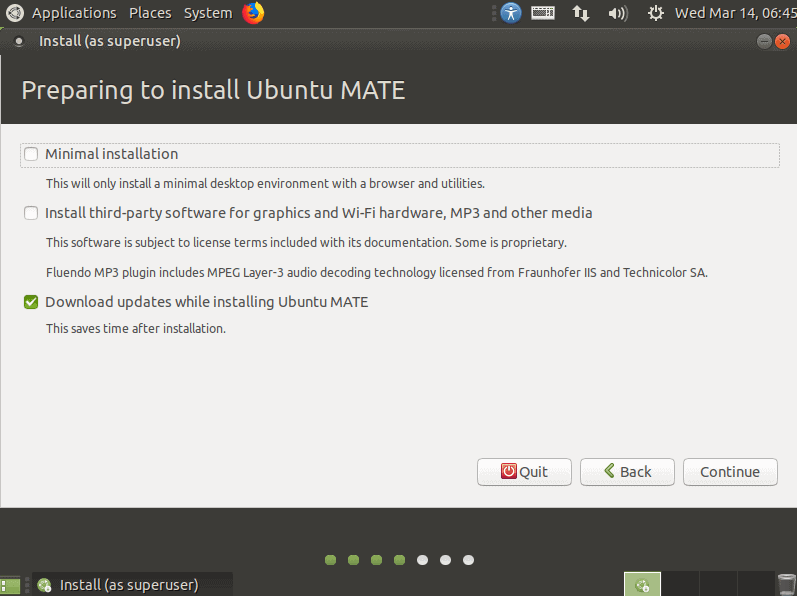 Its also worth checking out this article, about some other changes coming up with regards to Ubuntu. Now you: Do you plan to switch to Ubuntu 18.04 when it’s released? Tell us why / why not in the comments below! I see an option for minimal Installation…! Is that new? or software that is not of my preference. If I want bloat Id stick with WIN-bag OS. Im too new to Linux to be messing with problems that I cant understand. Bionic Beaver…I even like the name. I don’t know about Ubuntu, but most distros provide some sort of “advanced” or “custom” installation path where you can specifically choose what you want to have installed, rather than taking their pre-selected group of applications. Thank you…. I was unaware ..
I’ll have to look more closely..
AFAIK the Ubuntu 18.04 release full ISO will include a ‘minimal’ option for the first time. They have always had the ‘mini’ iso which lets you install a minimal, command line system and then add what you want including a Desktop Environment. The Debian ‘network installer’ is the same idea and is even better IMO. Well, for me it actually is…. Seems like you think so too …or my comment wouldnt bother you. I doubt you can even admit it too yourself. Im old euff & smart enuff to know that if Info is collected on us it WILL Be used against us. Somehow somewhere sometime…..there arent even any measures to make sure its accurate. Doubt me… look at how the internet just brings out the worst in people…. The greatest invention in the history of mankind…..used to abuse one another…..